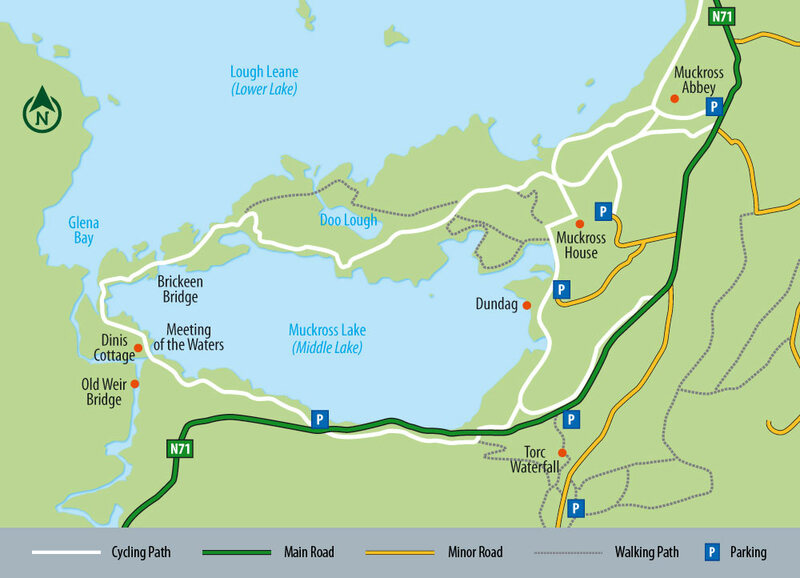 Muckross, in the heart of Killarney National Park is an ideal location for a days cycling. Leaving Killarney town, cycling along the Muckross road and over the Flesk bridge. At this point you can cross the road to the cycling path which will lead you directly into the National Park. Bear in mind that Jaunting cars and walkers also use this path. The paths travels alongside the raod for about a kilometre, before veering right into the Yew Valley Wood and towards the 15th century Muckross Abbey. Take time at the abbey and explore the well-preserved ruins and vaulted cloister. Muckross Abbey was also the burial place of local chieftains, and in the 17th and 18th centuries, the three Gaelic poets, Geoffrey O’Donoghue, Aodhagan O’Rathaille and Eoghan Rua O’Suilleabhain. From here, travel on past Muckross Traditional Farms and the fine Victorian mansion that is Muckross House. Guided tours are available of the house and a tour of the Farms is a must for both adults and kids alike. Muckross Craft Centre, located close to the house has a great restaurant and shop as well as a number of craft workshops which include Bookbinding, Weaving and Pottery. Beyond Muckross House lies the famous Torc Waterfall. You’ll need to walk for 5-10 minutes from the road to see the waterfall. If you have more time, the Muckross-Dinis loop around Muckross Lake is a great trip. Be sure to travel the loop in an anti-clockwise direction only. Knockreer lies adjacent to Killarney town with two entrances to Killarney National Park – the first at Cathedral Place (next to St Mary’s Cathedral) and the other beside Kenmare Place (close to the Killarney Cinema). All of these paths links together so you can enjoy many aspects of the park. 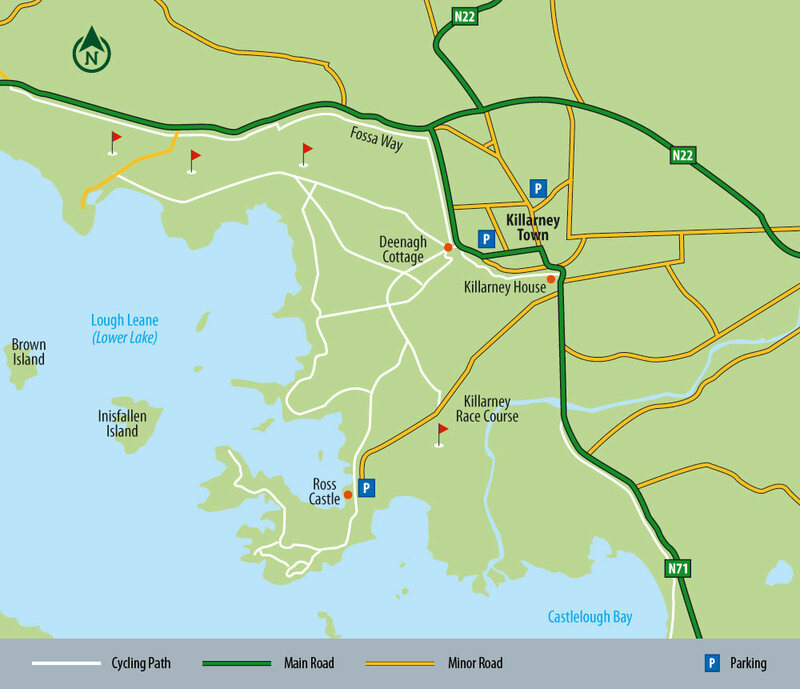 From the Cathedral Place, you can cycle north on the Fossa Way towards the village of Fossa or alternatively head west towards Killarney Golf and Fishing Club (beware of golfers playing across the paths, so prepare to dismount). You can also cycle to Ross Castle and Ross Island to enjoy the Copper Mines trail and the views from Governor’s Rock and Library Point. A great day out and one of the best ways to experience Killarney National Park. After picking up your bike at either Beech Road or Muckross you cycle through Knockreer Park to Ross Castle to arrive at the pier for approximately 10.30am. 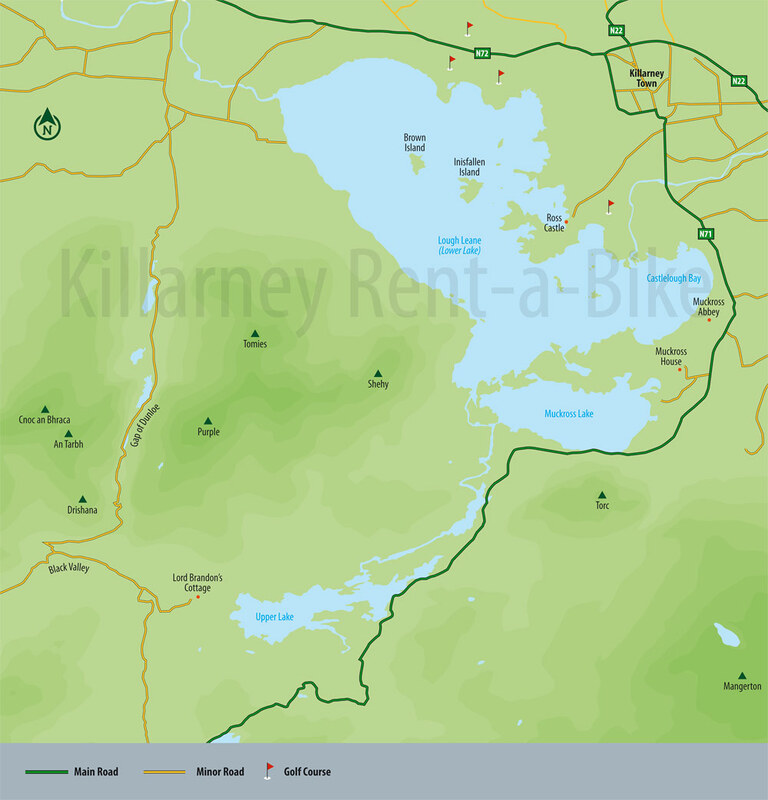 From here you will have a guided trip through Killarney Famous lakes via the long range to Lord Brandon’s Cottage. From there you leave the boats behind and cycle back to Killarney via the Black Valley and the famous Gap of Dunloe.